The major dome of high pressure over the western US continued to bring calm, sunny weather and record high temperatures to the Crested Butte area for another week. The Elkton weather station at 11,000 ft recorded daytime highs in the mid to upper 40s from March 15th through the 21st, and nighttime lows that did not drop below freezing from the 14th through the 20th. It was full blown “beach weather” for Crested Butte’s spring break. 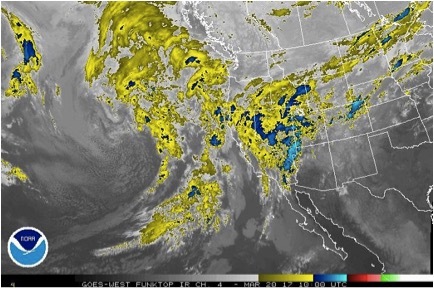 On the 21st a moisture-laden Pacific trough began digging towards the California/Baja coast. This initially brought a warm, moist southwest flow with a mix of sun and clouds through the 22nd. On the 23rd, the high pressure and above average temperatures were finally pushed out by the trough and a closed low pressure system began impacting Colorado with a cold front. The storm hammered the San Juan Mountains but came in relatively light for our area with Irwin and CBMR reporting 2-4 inches on the 24th, Schofield Pass recording 9 inches, and unusually tame NW winds gusting into the 40s. Skies cleared by the morning of the 25th allowing for fantastic weather for the Grand Traverse. A weak, fast moving trough brought light snow showers to the area that night. The storm quickly moved past and skies cleared again, with generally cooler temperatures on the 26th and 27th. Overnight lows were back down to the low 20s. Spring squalls due to a closed low moving overhead brought 3-4 inches of snow on the night of the 27th into the morning of the 28th. The 29th and 30th were another set of warm and calm days before a final closed low pressure system on the 31st. This storm came in light and warm with general accumulations of 1-2 inches and 6 inches at Schofield Pass. 3/20/17 – Satellite image showing the moist Pacific trough beginning to impact the west coast. On March 16th the persistent slab problem was finally removed from the list. 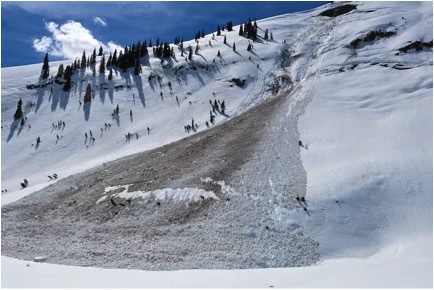 The last human triggered persistent slab avalanche on the buried near surface facets occurred on March 4th, suggesting the layer had become dormant or unreactive in its dry snow state. However, the string of increasingly warm days without solid overnight freezes introduced more and more free water into the snowpack, especially on east, south, and west aspects, and persistent slab concerns were replaced with wet slab concerns. This free water was getting deep enough in the snowpack to pool up on these buried crusts and weak layers, potentially destabilizing them and threatening to release wet slab avalanches. Wet slab avalanches remained on the problem list until the 23rd when colder temperatures aided in refreezing the snowpack. 3/18/17 – Natural wet slab/glide crack avalanche on an east aspect at 10,500ft. 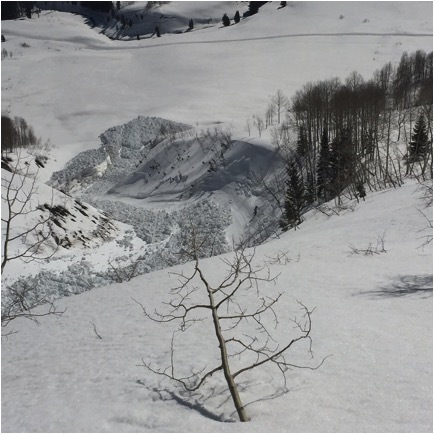 The continued warm weather with poor refreezes was also causing an increase in frequency and potential size of wet loose avalanches. The large amount of free water in the snowpack was creating the potential for small point releases to gouge down and become bigger and far more consequential. On the 22nd, this threat, along with wet slab concerns, raised the avalanche danger to Considerable below tree line. Large wet loose avalanches posed a threat until the 24th when new snow and a solid freeze limited the wet loose avalanche concerns to small surface instabilities through the 25th. Loose wet avalanches then stayed off the problem list until the 29th and 30th, when warmer temperatures and some new snow brought back the potential for small wet loose avalanches involving the fresh snow. 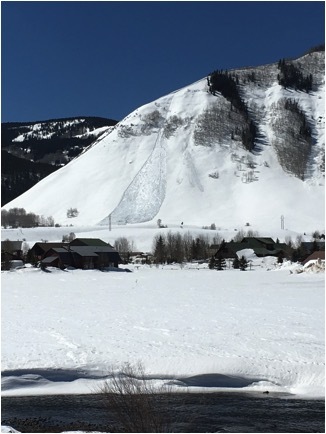 3/16/17 – Large natural wet loose avalanche on Gibson Ridge. 3/19/17 – Large natural wet avalanche below Gothic Peak that gouged down and triggered wet slab avalanches on its flanks. The 2-9 inches of new snow combined with moderate NW winds on the 23rd, added small wind slabs to the problem list until the 25th. The spring snow squalls on the night of the 27th again added small wind slabs to the problem list on the 28th. In both cases the wind slabs were confined to loaded, above tree line slopes. On the 26th, 27th, and 31st, solid overnight freezes and little to no fresh snow resulted in no avalanche problems and the avalanche danger being rated at Low at all elevations.